The NBA has extended its exclusivity contract with EA and 2K Games, guaranteeing at least a few more years of the status quo for fans of virtual hoops. The contract, which is described simply in the official press release as "multiyear," gives EA and 2K Games legal rights to the use of NBA teams and arenas, as well as players belonging to the National Basketball Player's Association. "We have had successful and longstanding relationships with both 2K Sports and EA SPORTS," said Executive Vice President of NBA Global Merchandising Sal LaRocca. "Extending our agreements with the top sports video game developers continues to maximize our presence in this category, while ensuring our fans the best selection of NBA video games." In layman's terms, this contract guarantees that EA's long-running NBA Live series, and 2K's NBA 2K series will maintain their positions as the two major options for gamers looking for videogame basketball. Actually even calling them "major" is a bit disingenuous, as the exclusive NBA contract virtually guarantees that no other company is able to release a basketball title. It is technically possible that a developer might create a basketball game, but given the terms of the contract, this theoretical game would lack the sport's famous professional athletes, and as proven by the relative retail failure of 505 Games' Backbreaker (at least as compared to EA's perennially successful Madden football series) there is little to no mainstream interest in a sports game that lacks familiar teams and players. Adding an interesting wrinkle to this whole situation is the current ethereal status of EA's NBA Live series. 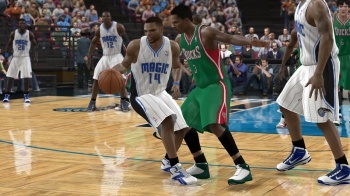 After ditching the Live name in favor of calling the 2011 iteration NBA Elite the game's developers canceled the game in November of 2010, following a string of delays. Speaking with unprecedented candor, EA representatives claimed that the development team had determined that Elite "was just going to be a bad game," and that the series would be shelved for a year in the hopes that the next year's version would live up to the publisher's high standards. So far there is no word on when we might see the next version of either EA's NBA Elite or 2K Sports' NBA 2K titles, though presumably this contract extension guarantees that we won't be without a new hoops game for much longer.